Have you ever been out on ride and reach for your water bottle only to realize that it's bone dry? If out for a quick spin you can probably make due, but when going for a longer period - especially when bikepacking - not having enough water can turn serious. The folks at Sawyer have been in the water filtration business for some time, with their products being well known by many back-country explorers. 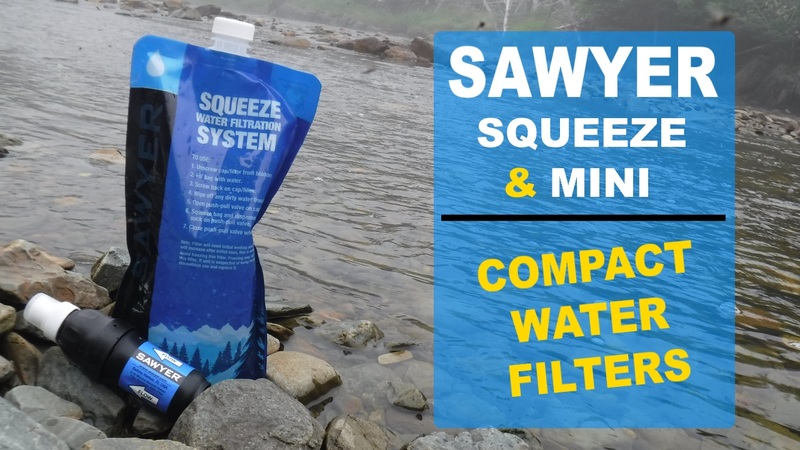 Fatbike Republic reached out to the folks at Sawyer who provided samples of their more popular filters for review – the Mini and the Squeeze. 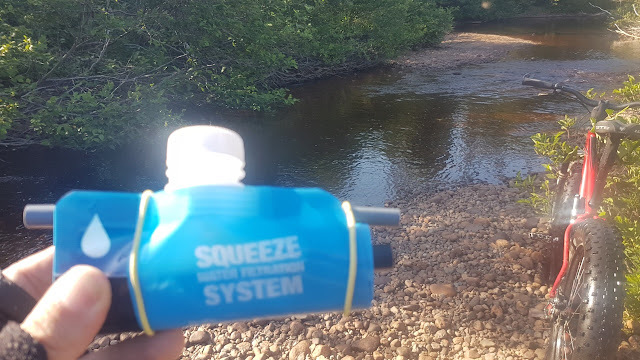 Both the Mini and the Squeeze use the same technology to filter nasties from water. The units contain a large number of “U-shaped” hollow tubes that trap contaminants larger than 0.1 microns, allowing the cleaned water to flow through. Both the Mini and the Squeeze are able to be cleaned (backwashed) using the included syringe which restores up to 98.5% of the flow rate. The smaller filtering membrane of the Mini is rated for up to 100,000 gallons so it probably safe to assume that the larger Squeeze is good for that amount as well. At 64oz/day (8 glasses of 8 oz) that is enough water to last one person 560 years. That’s a lot of water! The Sawyer Squeeze is available in two configurations – the SP129 and the SP131 with the primary difference being additional water pouches. 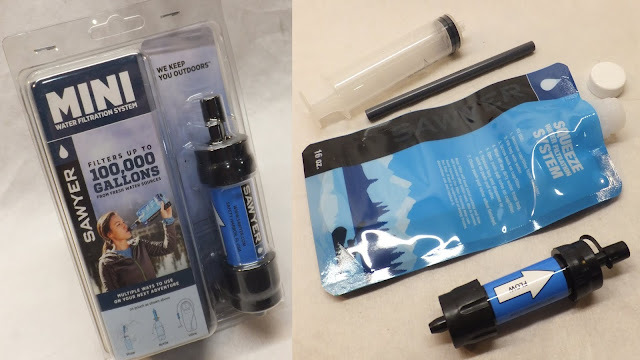 Fatbike Republic received the SP129 and the contents included: 2 – 32 oz (1L) collapsible pouches for holding water, plunger for backwashing (cleaning), inline adapters, drinking straw/gravity tube and a mesh carrying pouch. The Squeeze weighs in at 2.4oz (68g) which is considerably less than the claimed 3oz (85g). The entire kit only weighs in at 6.5oz (186g) which is much less that a 500ml bottle of water at 18.3oz (518g). When rolled up the entire kit does not take up much space, and this can be pared down if you only carry one pouch and the filter. 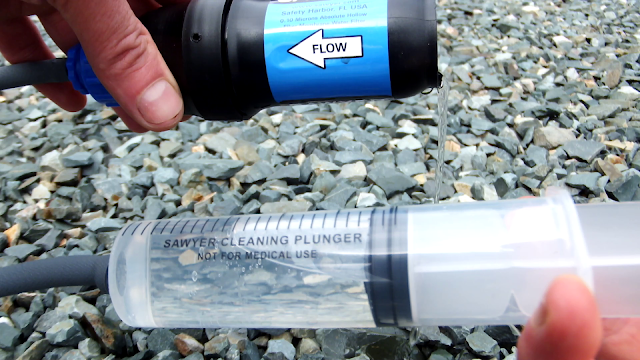 The Sawyer Mini provides the same type of filtration, but in an even smaller package. The Mini kit is available in several colours, but with the same contents: 1 – 16 oz (500 ml) collapsible pouch, cleaning plunger and drinking straw. Sawyer claims that the Mini weighs only 2oz (57g), however its actually closer to 1.25oz (35g) with the entire kit weighing 3.2oz (91g). It should not take up any more space than a large chocolate bar. With the details out of the way its time for the Squeeze and the Mini to hit the backwoods with two different riders on two separate paths. Having a couple of bikepacking trips under my belt I quickly realized that water is an extremely heavy necessity. Not only is it needed to keep hydrated while riding, it is also needed when cooking. While boiling will normally kill most water bourn nasties in my neck of the woods, there is always the concern of not boiling it long enough. And it also has to cool down if transferring to a water bottle. The Squeeze accompanied me on two bikepacking trips. Rolling the filter up in one collapsible pouch, securing it with an elastic band and dropping it in the carrying pouch it took up very little space. It could practically be stuffed anywhere. Using the Squeeze is extremely simple - fill the pouch, attach the filter to the pouch, invert and squeeze. In areas with shallow streams it is a little easier to fill the pouch when using another container (cup, bottle, plastic bag) to transfer the water. In deeper water bodies (>4 inches) filling can be accomplished by simply immersing the pouch. 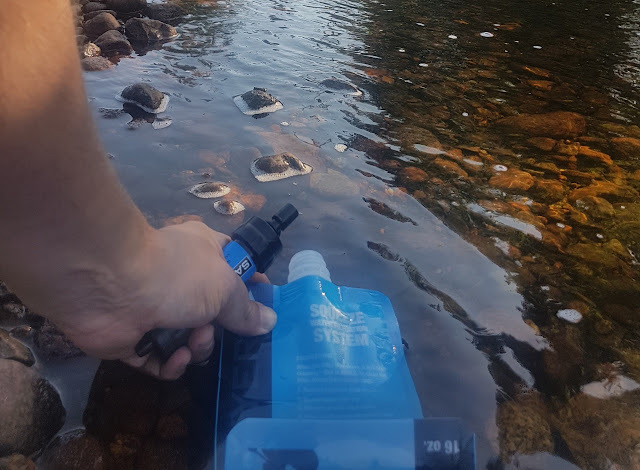 I quickly realized that if camping any distance from a water source, it would be a good idea to take along the second pouch to make less trips to the stream. When the pouch is filled you do not have to filter it immediately. The pull/push nozzle and cap on the Squeeze will keep the water from leaking out of the pouch until needed. I stored it both hanging from a bungee in the carrying pouch and just laying on the ground. I filtered the water into a cooking pot, directly into a water bottle and even used it as a source of running water for washing and brushing my teeth. While my primary purpose of water filtration was for cooking, on one particular trip I did run out of water while riding. Finding a stream, I filtered the water directly into my water bottle. The water tasted fresh with no chlorine or iodine flavouring (as with some other filters) and I did not experience any unexpected trips to the bathroom. And cleaning was dead simple. Attach the adapter to the outflow end of the Squeeze, fill the plunger with clean water, attach the two with the supplied hose and depress the plunger. The clean water flowing in the opposite direction cleans out any debris that may impede filtering. I have always wanted to try bikepacking. Being a mountain biker for 10 years and a fatbiker for 5 there was something about strapping camping gear to a bike and heading into the woods that reminded me of my youth. It took me a while to collect all the gear, with one of my biggest concerns being how much water to carry. 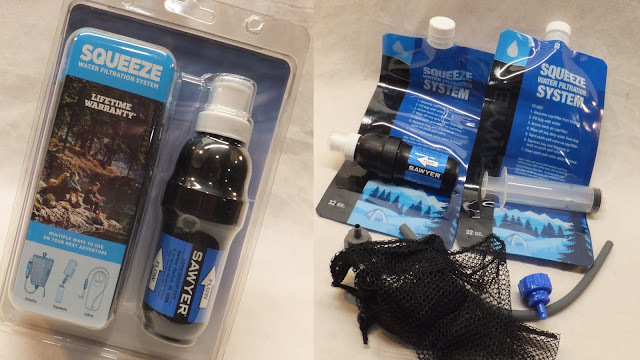 Prior to hitting the trail on my first overnighter I did some research on the Sawyer Mini and discovered that these small devices are being used all over the world to purify water. Reviewing the instructions in the box it looked simple to use and it was so small. Nevertheless, I did take plenty of water for my first overnight bikepacking trip that took me 30 km into the wilderness. Just after making camp, supper was on my radar with noodles on the menu. I grabbed the Mini and the water bag and headed down to the stream. The bag was easy to fill but a little slow in the shallow stream. Filling my cooking pot and my empty water bottle I headed back to camp to fire up the stove. It was nice to have the security of my water being filtered and boiled. Heading out the next morning I ran low on water at about the half-way point and remembered the water bottle I filled the previous evening. The water tasted fine and there was no strange smell or aftertaste. Since that trip I have expanded my bike collection with the new bike having even less space to store gear and water. The Mini will definitely be going on future bikepacking adventures and even on longer day trips to make sure I have enough water. Both the Sawyer Squeeze and Sawyer Mini are compact and convenient water filtration systems. They are very simple to use, can be cleaned and are claimed to filter water born bacteria, protozoa and cysts greater that 0.1 microns. Before heading out on your next epic bikepacking adventure or extended day ride, be sure to check out the Squeeze and the Mini. You may just want to add one to your kit. Insulated water bottles are not made out of wood per say, but a different material that does not allow heat to conduct through to the liquid inside, keeping the water cool.